Alexander Looby reporting to police on April 19, 1960, after his house was bombed. Attorney and civil rights activist Z. Alexander Looby was born in Antigua, British West Indies, on April 8, 1899, the son of John Alexander and Grace Elizabeth Joseph Looby. After the death of his father, young Looby departed for the United States, arriving in 1914. Looby received a bachelor’s degree from Howard University, a Bachelor of Law degree from Columbia University, and a Doctor of Juristic Science from New York University. In 1926 he came to Fisk University as assistant professor of economics and remained until 1928. At various times he later served as a lecturer at Fisk University and Meharry Medical College. In 1929 Looby was admitted to the Tennessee bar and practiced law in Memphis for three years. He returned to Nashville and helped to found the Kent College of Law, Nashville’s first law school for African Americans since the Central Tennessee College’s department of law (1877-1911). In the Civil Rights movement of the World War II era, Looby rose to a position of local leadership. After losing a 1940 runoff election to a white opponent in a race for city council, from 1943 to 1945 he presided over the James C. Napier Bar Association. In 1946 the National Association for the Advancement of Colored People hired Looby, Maurice Weaver, and Thurgood Marshall to represent the African Americans charged with murder following the recent race riot in Columbia, Tennessee. Looby’s legal defense helped acquit twenty-three of the defendants. He crisscrossed the state in the company of other black lawyers, arguing against Jim Crow and discrimination. Looby is credited with desegregating the Nashville airport dining room and the city’s public golf courses. Soon after the momentous U.S. Supreme Court decision of Brown v. Board of Education of Topeka (1954), Looby filed a suit against the local public schools on behalf of A. Z. Kelly, a barber whose son Robert had been denied access to a nearby white school. During the sit-in demonstrations and civil rights marches of the 1960s, Looby and other black attorneys provided money and legal services for local college students who were arrested and jailed. 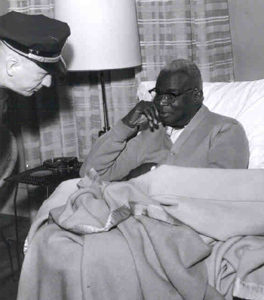 On April 19, 1960, his Meharry Boulevard home was destroyed by dynamite. Looby viewed politics as a way to change an oppressive system. In 1951 he and fellow attorney Robert E. Lillard became the first blacks to be elected to the city council since 1911. In 1962 he lost a bid for a seat on the Tennessee Supreme Court. A year later, Looby became a member of the Metropolitan Charter Commission. In 1971 he retired after serving on the old city council and the new Metropolitan Council for a combined total of twenty years. Looby died on March 24, 1972. Ten years later, the Nashville Bar Association, whose white members had denied Looby’s membership application in the 1950s, posthumously granted a certificate of membership in his name. His contributions to Nashville are recognized in the Z. Alexander Looby Library and Community Center erected by the city on Metro Center Boulevard.